This dual-bay SATA HDD/SSD docking station lets you dock and swap drives from your desktop or laptop computer simultaneously, using a single USB port. It supports two 2.5/3.5â€ SATA hard drives or solid-state drives. 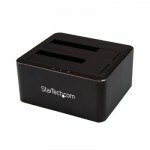 The SDOCK2U33V is backed by a StarTech.com 2-year warranty and free lifetime technical support.